The Pear’s current production is another alarmingly topical piece from the not-too-distant past. This time, audiences are transported back to 1974 and the rural village of New Bethesda (properly named Nieu-Bethesda) in the Karoo region of South Africa. Athol Fugard’s play, The Road to Mecca, incorporates themes of racial and gender inequality and religious fervor that are so prevalent in the rural South African culture of the time. These issues are in the forefront of this work, at times uncomfortably so. Additionally, the themes of trust, love, aging, and artistic freedom and inspiration are explored in a powerful way. This is a challenging piece, and the Pear gives it the respect and sensitivity it deserves. 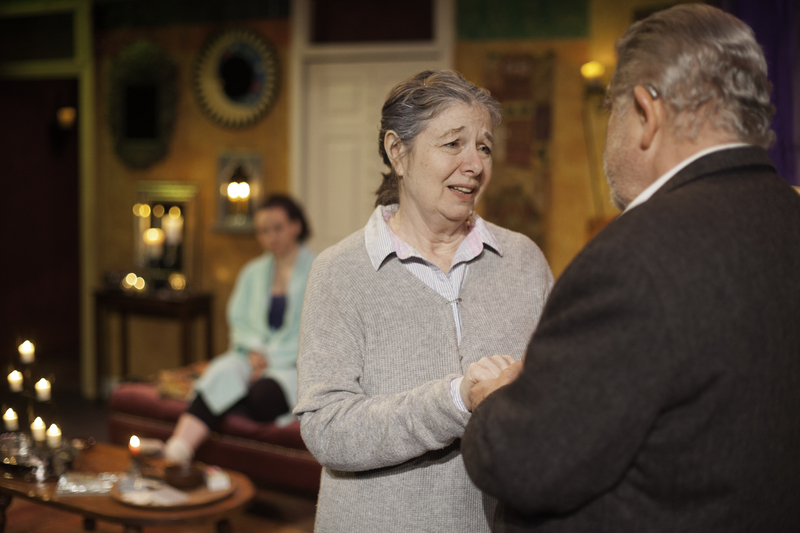 The central character, Miss Helen (Diane Tasca), is facing a life crisis, though that doesn’t become entirely clear until almost the end of the first act. She’s an elderly widow living alone in the village. She’s a rather eccentric artist who has sculpted an eclectic collection of statues into what she calls her “Mecca,” not necessarily as it pertains to Islamic faith, but more as a concept of purpose and for achieving a far-off goal. She envisions a particular form, such as a mermaid, owl, or camel, and is compelled to create it out of cement right then. These sculptures permeate her yard. In addition, she’s drawn to color, texture, and light, and the interior of her house reflects that. Miss Helen is based on a real person, Helen Martins. The real Martins was an artist born at the very end of the 19th Century in this same rural village. Although the fictional Miss Helen’s specific personality was created to suit the play, the art discussed in the play is fairly accurate. Martin’s house came to be referred to as Owl House. In 1991, it was declared a national monument and was turned into a museum. Like Martins, the fictional Helen is quite reclusive, and Miss Helen’s three remaining friends are important to her. One close friend is never seen or heard, but she is crucial to the plot. She’s a colored woman named Katrina who frequently stops by to chat and to help Miss Helen around the house from time to time. At one point, despite the social stigma, Helen points out rather forcefully that Katrina is not a servant; she is her friend. Elsa Barlow (Briana Mitchell) is another friend who lives quite a distance away. She shows up unexpectedly at Helen’s house early in Act 1. She’s a young, idealistic, feminist, English language teacher living in Cape Town, some 12 hours away by motorcar. She shuns the conservative constraints that engulf the community in which Helen lives, pushing Helen to follow her bliss. Marius Byleveld (John Baldwin) is the village’s dominee (i.e., a minister of the Dutch Reformed Church). He moved there 20 years previous to return to his more rural roots and community. He too is one of Helen’s friends, though he is quite conservative and conventional, often at odds with Helen’s eccentricities. Therein lies the conflict. Both Elsa and Marius are pushing Helen, but in opposite directions. The set is impressive depicting the main living area in the interior of Miss Helen’s home. Three areas are evident including a living room couch, a dining table, and a sleeping berth. Far stage left, there’s a basin that’s clearly used for washing up. A door upstage of the couch represents the front door, and upstage right is an entryway to access the unseen kitchen. Mirrors and candles are everywhere as are brilliant colors mixing greens, browns, yellows, and pinks. There are numerous bottles hanging in various formations all over the ceiling. Lighting designer, Ben Hemmen, provides a design that runs the gamut from slightly subdued light to brilliant day light. 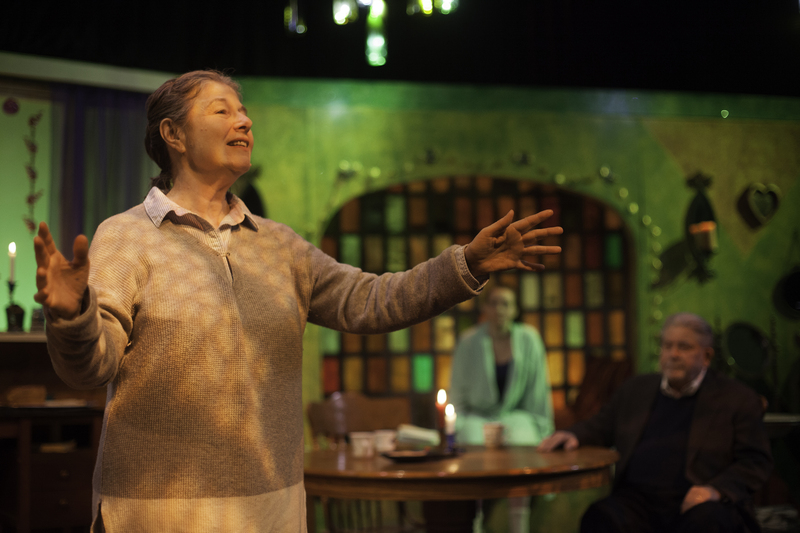 Real candles are on stage, their flickering flames providing an intimate effect for certain scenes, and for the brighter turns, even the bottles come into play at one point. Sound designer, Rachel Bratt, provides some smooth jazz preshow, and enhances some scenes with more Middle Eastern sounding music, particularly for the Mecca discussions. The music never overpowers the scenes, but it greatly enhances and intensifies the tone of the action. Elizabeth Kruse Craig directs this production, having maintained a close relationship with this particular play since she first read it very early in her training. She’s assembled a cast that brings authenticity and edge to their roles. Both Baldwin and Tasca play Afrikaners, and both have mastered the speech patterns nicely. Mitchell plays a more cosmopolitan character of British heritage, and her speech pattern diverges from the Afrikaans accent. The story is a little slow getting started. That’s not the actors’ fault. The play is written to ease the audience into the central issues. The issue at the heart of the play doesn’t become clear until close to the end of Act 1. Before it does, Miss Helen and Elsa banter, play, and argue. Tasca and Mitchell are at ease with their characters, convincingly establishing the relationship between these two intergenerational friends. Tasca’s Helen is a tad sheepish. Her body language implies that Helen is hiding something as she wrestles with her sleeves, keeping her hands largely hidden. She paces a lot showing Helen’s discomfort. Mitchell’s Elsa is more forthright and slightly overstated. She appears rather hyper initially, which seems odd given Elsa just spent 12 hours driving. Elsa is also struggling with some inner demons that don’t become clear right away. 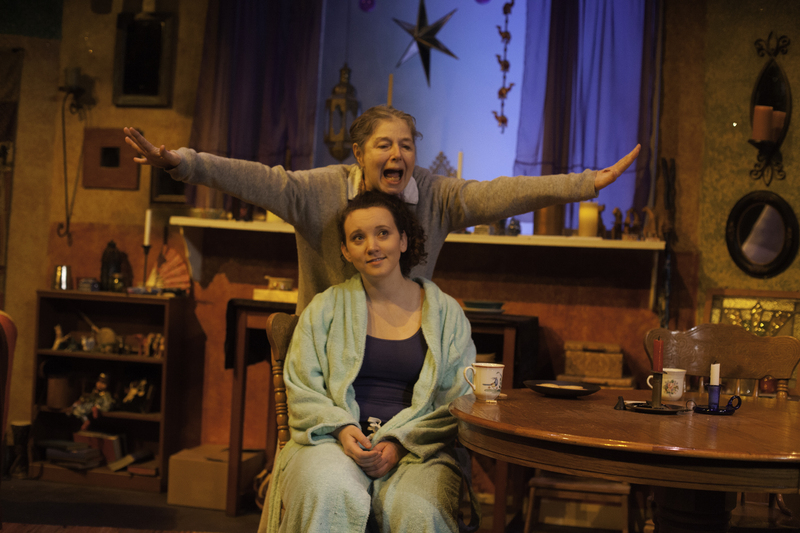 Throughout Act 1, both characters share some of their motivations and concerns with one another. Baldwin makes his first entrance just before the end of the first act, bursting into the room with purpose. He’s a major player through the rest of the play, and he is convincing as Marius. Marius is a force to be reckoned with, both as a community authority figure, and as a friend. Although the play is serious overall, it employs a fair amount of humor. It also has a good deal of tension, and during the most heated scenes, all three actors sometimes misplace a stray word. Although not always spoken precisely as written, these slight word slips add reality to their arguments, just as one might misspeak when exasperated. Act 2 is much tighter than Act 1. The story moves more quickly, eventually resolving in a reasonable fashion, although not everyone gets the result they seek. Although the story takes place in a distant land, the central issue is one that is very relatable. It is also one that almost everyone will encounter to some degree should they (or someone they love) live long enough. In the end though, the story makes it abundantly clear that no matter the course, it is the journey that counts. See http://thepear.org or call (650)254-1148 for tickets or more information. A Good Reed Review gratefully accepts donations via PayPal to help defray the costs of maintaining this site without creating paywalls.